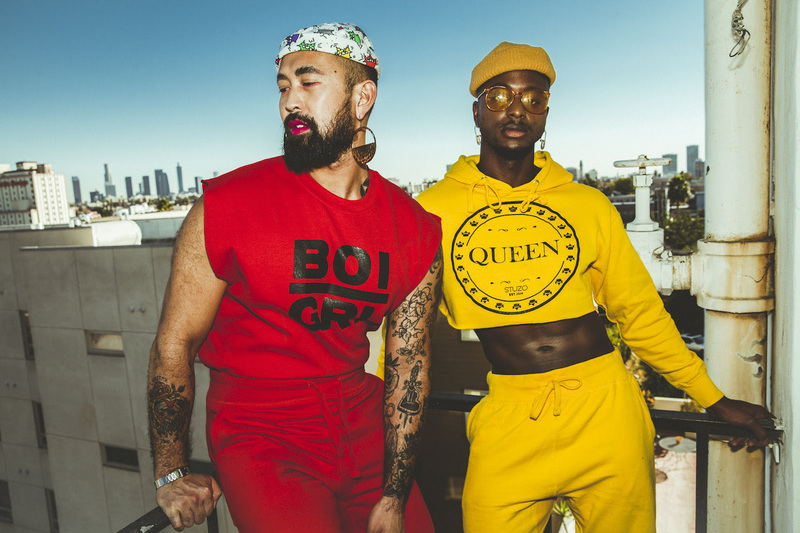 Home #Hwoodtimes Stuzo Clothing will heat up the runway at The Dinah 2019! Harlem Globetrotter Crissa Jackson to make appearance! STUZO CLOTHING started in 2010 by Stoney Michelli & Uzo Ejikeme. Although based in Los Angeles, their hearts beat to the drums of the big city of New York! Our mission is to create a space in the fashion world where all are welcome without judgment. Stuzo Clothing is a genderless clothing company designed to invoke thought and emotion. Our brand is for the non-conforming and bold at heart. Our pieces are unisex or gender free as we prefer to call them because clothes don’t have any organs last time we checked. We are inspired by love, people and life. Whatever shape or form you choose to exist in, we celebrate that! Crissa Jackson to bring her skills to The Dinah poolside! Crissa Jackson, the 13th woman to play for the Harlem Globetrotters, is from Harrisburg, PA but currently resides in New York, NY with her beautiful wife, Alexis, and amazing daughter, Olivia. Although she is a basketball and fitness fanatic, Crissa is a total woman empowerment enthusiast. She recently launched a woman empowerment nonprofit, I AM Movement Inc, with her wife, for girls ages 6-18 to help inspire and empower the women of our future. Crissa’s purpose in life is to open people’s eyes to see from a different point of view and to help them embrace their full potential in their life. You can follow her journey on Instagram @CrissaAce or all social media platforms. You may also support her nonprofit by visiting IAMMovement.net. Don’t miss your chance to meet Crissa poolside at The Dinah as she shows off the skills that landed her a coveted spot on the legendary Harlem Globetrotters! There’s a reason The Dinah is considered the largest lesbian event in the world and there will be something for everyone at what is expected to be the biggest event to date in 2019! 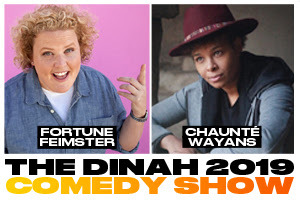 With so many amazing musical performances already on the books, we’re excited to welcome our hilarious comedy talent for The Dinah 2019: Fortune Feimster and Chaunte Wayans! Both of these amazing women are making huge waves in the comedy world, appearing in feature films and on hit TV shows across major networks, collaborating with the likes of Chelsea Handler and Katt Williams, and releasing stand up specials on Comedy Central and Netflix. Both women are wonderful examples of never holding back your talents and powering through to find massive success in a traditionally male-dominated industry. We can’t wait for them to put stitches in your side at The Dinah’s Comedy Show. Follow Fortune Feimster on Instagram, Facebook, and Twitter. Check out her stand up on Conan HERE. Follow Chaunte Wayans on Instagram, Facebook, and Twitter. Check out her stand up on TruTV HERE. After making her debut with 2016’s double-platinum single “Hide Away”, 20-year-old singer/songwriter Daya wasted no time in skyrocketing her career. Soon after, she won her first ever Grammy Award for smash collaboration with The Chainsmokers “Don’t Let Me Down” (6x platinum), released a gold-certified album, and headlined a national tour. Just months after debuting at #5 on Billboard’s 21 Under 21 list in 2016, the Pittsburgh-born independent artist emerged as the youngest honoree on Forbes’ 30 Under 30 music list in 2017. In addition to signing with Interscope Records and releasing two of her own singles (“New” and “Safe”), Daya has collaborated with Gryffin/Illenium (“Feel Good”) and RL Grime (“I Wanna Know”). Stream “Sit Still, Look Pretty” and “Don’t Let Me Down”. Follow Daya on Instagram, Facebook and Twitter. Kiana Ledé will be bringing her soulful R&B stylings to the Dinah stage, sharing her confessional and catchy songs to connect and unite us all! A self-made singer, songwriter, and actress, Kiana’s message is one of empowerment and never giving up despite challenges and disadvantages. She explains that growing up as a mixed race girl, she was able to pull from many influences, making her music so unique in today’s world full of copy-of-a-copy pop stars. Kiana’s career began at a very young age, winning an online talent competition, landing her first deal at 15 years old and performing on The Today Show and at the Macy’s Thanksgiving Day Parade. After that deal fizzled out, the budding talent moved to LA to pursue her career on her own. She launched the #SoulFoodSessions in 2016, acoustically serving up piping hot popular covers and generating over 50 million views in addition to a storm of coverage. Around the same time, she joined the cast of MTV’s Scream for season two in the role of Zoe Vaughn. Recognizing the grind, Republic Records Co-Founder and Chief Executive Monte Lipman personally signed Kiana. She contributed “Big Spender” to the chart-dominating official soundtrack for Fifty Shades Freed and released the 2018 debut EP,Selfless. As she received acclaim from Refinery29, Baeble Music, Complex,stupidDOPE, and more, the single “Fairplay” has amassed more than 10 million streamsand attracted A$AP Ferg for the remix. Powered by a fiery fusion of R&B, pop, alternative, and indie, she drops lyrics that toe the line between confessional and catchy. More on Kiana Ledé HERE. Watch “EX” and “I Choose You (Acoustic)”. Follow Kiana Ledé on Instagram, Facebook, and Twitter. More info on Bri Steves HERE. Watch “Jealousy” and “Late Night”. Follow Bri Steves on Instagram, Facebook and Twitter. Enigmatic musician Leikeli47 is on a meteoric rise with her new album, Acrylic, recently released by RCA Records and applauded by the likes of Pitchfork, Noisey, NME, The FADER, and just about everyone else in the who’s who of music journalism. Co-producers on the album include Clyde & Harry (Ludacris, Ghostface Killah), Dave Hamelin (The Belle Game, Sam Roberts Band) and Harold Lilly (Alicia Keys, Beyoncé, Zayn Malik). Leikeli47 has notched several appearances on the soundtrack for HBO’s Insecure, most recently with Acrylic‘s infectious single “Girl Blunt”, and has performed for Natalie Portman, appeared with Lion Babe at Coachella, and had her inaugural ArfroPunk performance—something up-and-coming artists only dream of. Watch “Girl Blunt” and stream “No Reload”. Follow Leikeli47 on Instagram, Facebook and Spotify. Rising pop star Dorian Electra makes music that defies gender norms. In the past year, their work has gained a queer cult following and led to them being named a must-know talent by Buzzfeed and one of PAPER Magazine’s “100 Women Revolutionizing Pop.” Not only that, but Electra has also quickly built a dedicated following thanks to their futuristic spin on 00s pop, 80s funk, and a long-standing love of satirizing rigid gender roles and views on sexuality. More info on Dorian Electra HERE. Watch “Career Boy” and “Man To Man”. Follow Dorian Electra on Instagram, Facebook and Spotify. Burgeoning Atlanta hip-hop talent Kodie Shane recently released Young HeartThrob (Epic Records), a new album that has seen praise from the likes of HighSnobiety, Complex, andVIBE, who say “Shane is set to make significant noise in the industry as one of 2018’s most promising young artists.” Young HeartThrob shows off Shane’s wide creative palette, dipping in and out of moments of pop bliss, hip-hop grit, and future-facing alternative ambience. Shane’s 2016 debut EP features fan-favorite “Sad (feat. Lil Yachty)” which garnered millions of Spotify streams, followed by the runaway success of “Drip on My Walk”. Across her releases, the artist has garnered praise from The FADER, Pitchfork, Vogue, Pigeons and Planes, Paper, NYLON, W Magazine, Interview Magazine, Mass Appeal and more. Most recently, Billboard named her one of 2018’s biggest pop stars to watch and she covered Galore’s Spring 2018 Music issue. The genre blending innovator has shared the stage with the likes of Lil Yachty, Lil Uzi Vert, The Internet, Snakehips, Billie Eilish. More on Kodie Shane HERE. Watch video “Flex on Me (ft TK Kravitz)” and stream official audio for “Thinking Bout You”. Follow Kodie Shane on Instagram, Facebook and Twitter. Eden Entertainment Group artist Diiamon’d Royalty is widely known in the LGBTQIA+ community for being a viral YouTube sensation after her freestyle video shortly broke the internet with over 1.5 million views. Not only is she a great freestyle and recording artist, but she’s a dynamite entertainer. She draws in her audience with her ability to lay it all out there and be her true self, thrilling audiences with her clever rhymes and smooth delivery. Her debut album Mirrorz (listen on Spotify) shows her growth and versatility as an artist. Diiamon’d Royalty is not a name you will forget soon and she is certainly a rapper to watch! More on Diiamon’d Royalty HERE. Watch videos for “Type of Way (cover)” and new single “Diamonds”.